Welcome back for February's Keeping Christmas Series. For my card, I started with simple layers. I am a little disappointed with my top layer, I used Distress ink to add some script on the background but after a few hrs it just seemed to be absorbed into the cardstock. If you look really close you can still see hints of it. 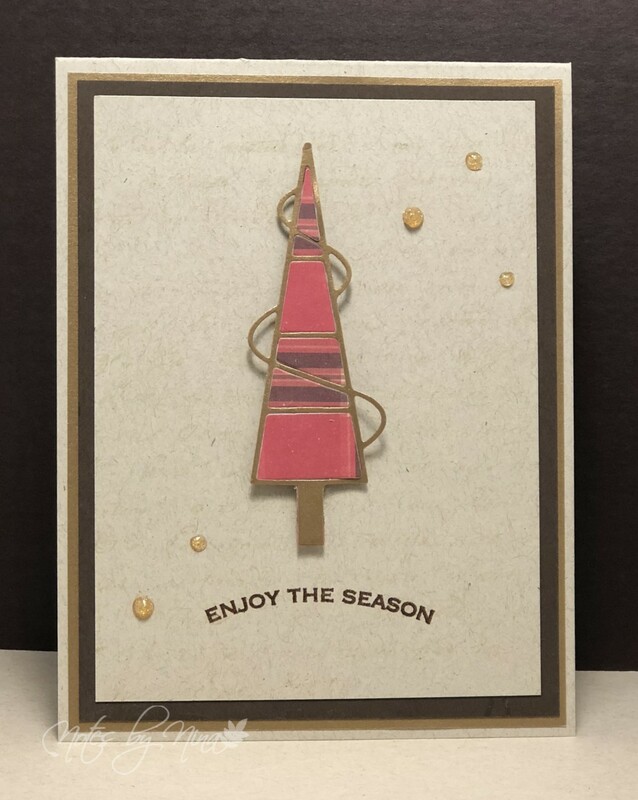 I die cut the tree twice, first with the gold shimmer paper then again with the plaid to get the body of the tree. I have the tree popped up with foam tape. I heat embossed the sentiment then finished with Nuvo glitter drops. This card would be so easy to duplicate and make multiples. Supplies: Kraft and brown cardstock, Designer Paper - Gold Shimmer and Echo Park, Penny Black - Script, Hero Arts - Banners & Messages, Penny Black - xmas tree, Nuvo - glitter drops. This is so cute Nina! I love that cute tree! You always do such a good job! I'm always excited to see what you make! Darling card, whether the script shows up or not. :) Love that sweet little tree and the perfectly scattered glitter drops. Very pretty and easy to do more than one of. I can see the background stamp and it does add a nice subtle texture to it. So beautiful...and I have to agree with the other comments, very easy to mass produce. such a wonderful card. I love this CAS design and that tree is super cute! 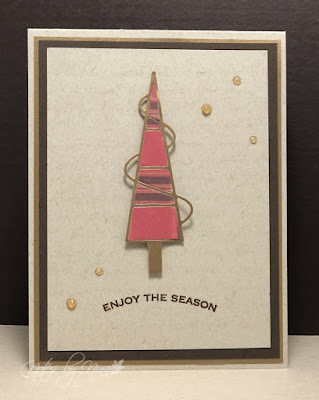 I love this simple, less fussy Christmas card and I especially love the colors! Just gorgeous!